Explore the exquisite Savute marshes from your luxury base at Savute Safari Lodge. Stay in one of 12 spacious thatched chalets raised on stilts and set along the tree line on the banks of the channel. Built from local timber and glass and decorated in fresh and inviting colours, each suite boasts a private veranda, combined bedroom-sitting room and ensuite bathroom. Library, lounge and bar plus alfresco dining area in the elephants’ playground. To ensure a private and relaxing environment, Savute Safari Lodge accommodates just twenty four guests in eleven thatched chalets built of local timber and one family room which consists of two double bedrooms. The chalets, which have been elegantly furnished in calm neutral tones to blend with the natural environment, feature expansive private decks, a combined bedroom and lounge area and en suite facilities. Savute Safari Lodge offers a shaded viewing deck, an al fresco dining area and swimming pool with spectacular pool loungers – ideal for watching the varied wildlife – including the resident Elephants – as they make their way to the Channel to drink, bathe and play. 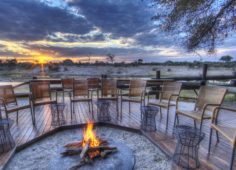 Set on the banks of the Savuti Channel of the Chobe region in Botswana, Savute Safari Lodge offers a great location from which to explore the nearby Savuti Marshes. This water attracts vast numbers of elephant to drink in the afternoons and evenings. The dry Savute channel is part of the active Savute ecosystem and renowned for its massive concentrations of elephant and lion and their troubled relationship. Accommodation at Savute Safari Lodge consists of 12 thatched chalets all raised up on stilts. Each chalet is large, and set along the tree line on the banks of the channel. The chalets are constructed of local timber and glass and decorated in fresh and inviting colours. Each suite has a private veranda, combined bedroom and sitting room and a lovely ensuite bathroom. The main area houses the library, lounge area and the bar which all provide great locations in which to relax during the day or discuss sightings in the evening over a few drinks. 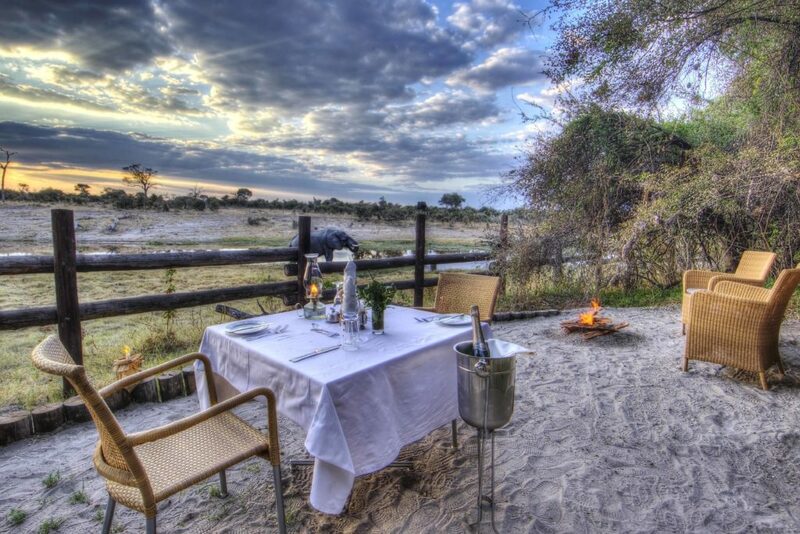 A short way down the banks of the channel from the main area is one of Savute Safari Lodge’s most entertaining features – an al fresco dining area at eye-level with the elephants which come down in the evenings to drink from the Channel. Activities at Savute Safari Lodge revolve exclusively around 4WD game drives in and around the Savuti Marsh and along the Savuti Channel. There’s also the chance to visit the ancient San rock paintings at Gubatsa Hills. Note: No children U12 yrs allowed. Birding, Flora, Leisure, Nature, Relaxation, Wildlife, And more. visit the ancient San rock paintings at Gubatsa Hills.